Book Binder App Update: Variant Chaos! 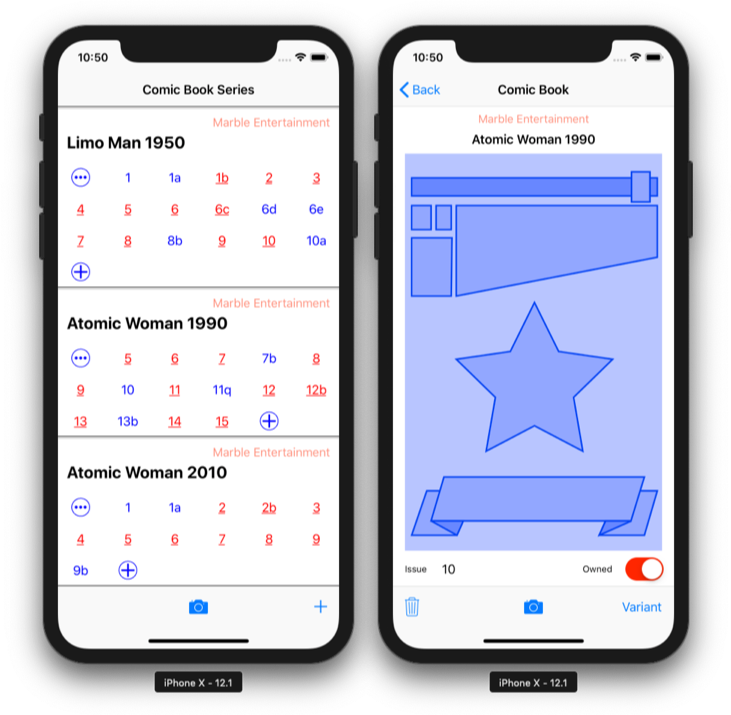 I’m still working on that comic book collecting app! It’s starting to look and feel like a real app but still has a long journey of test driven development ahead of it! On the left is the Summary View and on the right is the Detail View. The summary view displays all the series and all the issues in each series that you are tracking. The detail view displays a particular issue, selected from the summary view. As I’ve complained, comic book publishers have little or no organizing skills and important identifying metadata is driven by marketing and whims. My app has to shoehorn a seriously fuzzy world of comic book print editions into data structures that can be sorted. This requires hard choices about how to organize comic book data so the user gets a usable app. One of the biggest puzzles is what to do with variant covers! Purchase a recent issue of any popular comic book, especially from Marvel, and you’re just as likely to get a variant cover edition as not. Marvel, as far a I can tell, doesn’t identify variant additions with a signifier. This is probably great marketing. There is some unknown number of variant covers for Fantastic Four #1 (volume 6, started this year 2018). I’ve counted 28 so far! Hunting variants is like hunting Pokemon! You never know what is lurking in the next comic book shop. Some variant covers are created by famous artists, others feature famous moments or particular characters, some are specific to a comic book shop, and others are created for the dramatic effect of displaying all the covers side-by-side. Faced with no official designation and a need to figure out what you may or may not own, comic book collectors and sellers have developed their own, local, ways of identifying variants, usually a single letter or string of letters, but also potentially any printable character. There’s not much I can do to help the user other than provide some examples in the prompt and make sure she doesn’t add the same variant twice. I’ll probably find a way to list the current tracked variants, if any, and a way to add cover photo as well. But for now the simple text field does the job! I think this is why general purpose productivity tools, that give people the work of organizing information in to a structure, usually seem easier to use than specialized apps like Book Binder. A simple spreads sheet could be built in minutes the job that my app is taking months to figure out. I can’t easily use a spread sheet with my iPhone. I tried the iOS versions of Excel and Numbers and they are great for viewing but not so great for data entry or creation. Spread sheet are famous for being so open that errors in data and formulas are hard to detect. Squishy data like variant edition covers is easy to put in a spreadsheet but hard to test, hard to verify, and hard to maintain. 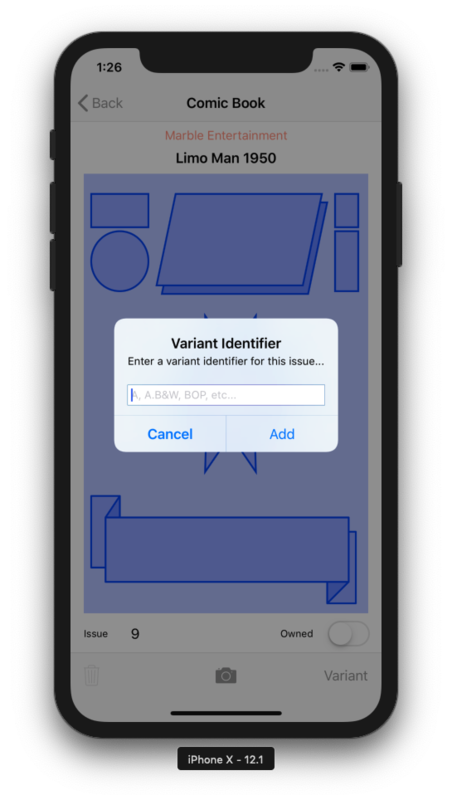 My long term hope is to use Apple’s MLCore Vision framework to identify variant editions on the user’s behalf. But that will only work if I work with a comic shop or collector who can tag all known variant editions and provide me with that data–or just make it available for free on a nicely scalable web server.